I’ve noticed many times this summer that while I go to the pool, I don’t actually want to get wet. Or swim! Something my kids think is crazy, God love ’em! They invite me in, but it’s cold when the water hits my tummy, I don’t want to leave with wet hair, it’s a commitment to go all the way under, and I am content to sit on the side and watch. I guess somewhere along the way I became a grown up and chose the convenience of being dry over the joy of going all in. But recently, I’ve noticed on the days I do go all the way in, it’s not too long after the dreaded hair wetting before I am jumping off the diving board, enjoying the slide, and laughing and splashing with chlorine in my eyes. I blink and an hour has gone by and I’ve totally lost track of time or what else we’re supposed to be doing that day. It is FUN! My daughter splashes me and I don’t care one bit…because I am already wet! When you go all the way in, you remember why you’re there. And once we surrender our desire to stay dry and untouched, we get to swim! And then wonder why in the world we held back. I think God has a way of inviting us to go all the way in too. We know it will change our course and take us out of our comfort zone. We know it’s going to get messy, and that it’s a commitment. There’s some big trust involved and it can be scary if you’ve never done it. Bear with me on the pool analogy! As a kid growing up in church in the south, I spent a lot of time at the “pool.” I knew what the pool looked like, even what it smelled like, I could talk about swimming because I’d seen people do it. I’d even gone in part of the way. But I had never personally experienced going all the way in until I was 30 years old. Because being dry was better until then. What changed my mind to accept His invitation? He did. It’s a long, hard and beautiful story summed up in one word…GRACE. Grace that counted more than my sin. Captivating, pursuing, relentless, offensive grace. Captivating because I knew my brokenness…being dry started burning me up, and Jesus…he saw it all. Saw it, and yet, he still went all the way to that cross for me. When he died on it and endured the wrath of God, he had me in mind. 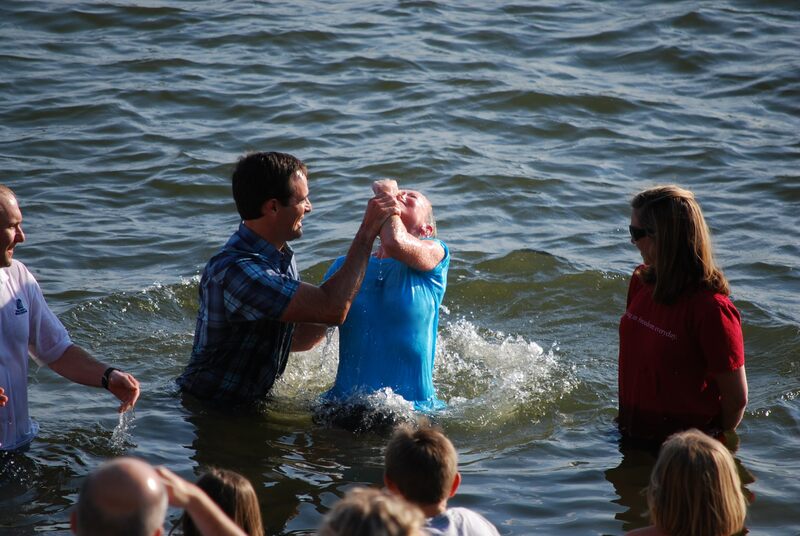 And when he rose to new life, he wanted me to come with him. Offensive because it took me out the equation. It didn’t matter where I’d been, what I’d done or what I could bring to the table to fix it…it was all about Jesus, the one who drew me to surrender, to cover me in his living water, to let him rescue me and pull me deep into joy, all in and through him. Why go all the way in? Because he did. As my daughter Mary says, he got boo boos so ours would go away. Amazing grace. 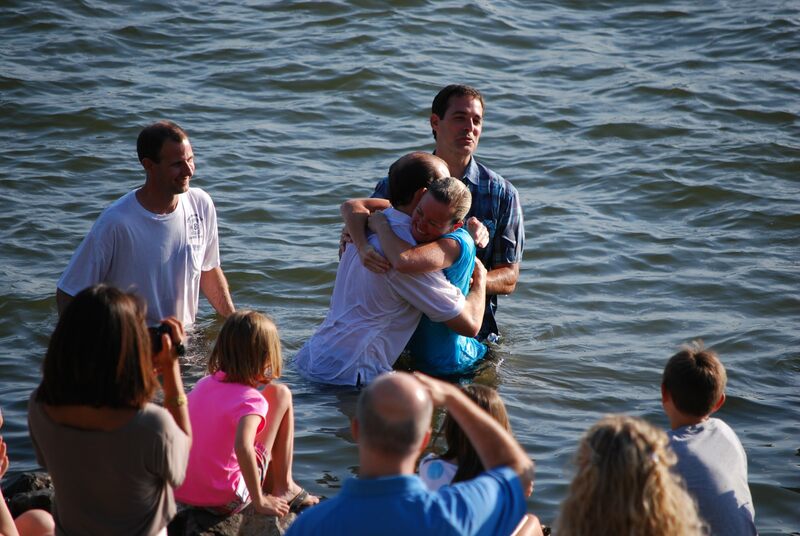 I think of the day Will and I were baptized in the Tennessee River two summers ago. We climbed down the rocky bank and waded into the river with our shoes and clothes on. I felt giddy and alive like a ten-year-old kid at summer camp stepping into that refreshing water. We were new creations celebrating resurrection from the dead on a beautiful June day, adults and kids cheering us on along the riverbank. The sun sparkling on that river was shining in us…pure joy as we outwardly expressed the inward reality that Christ had made us new! 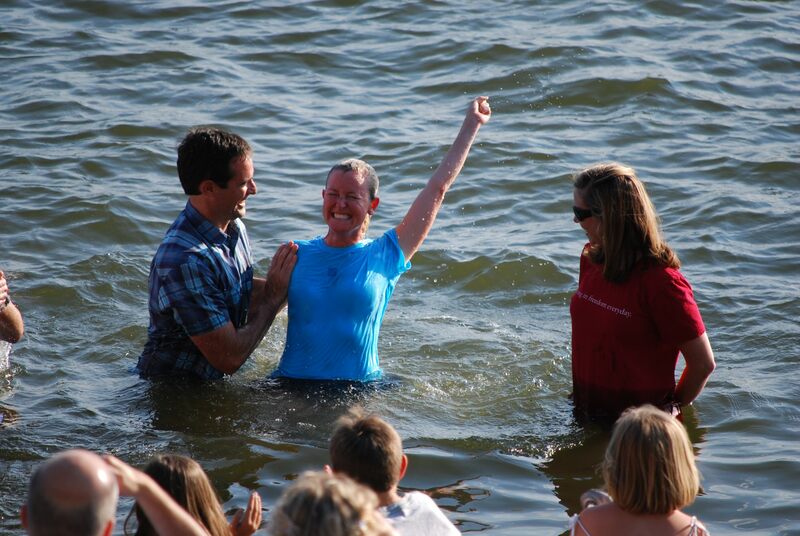 Sin and death washed away down that river…and the love of Jesus covered every part of us like the water, not an inch untouched…we went all the way in and came out soaring in new life! Many seeds were planted along the way that the Lord was faithful to grow. One of the first people to tell Will about Jesus is the very special lady who helped raise him, Evelyn. We call her “Mama Eddie.” We reconnected with her this weekend in Knoxville and celebrated all God has done in each of our lives! She invited us to church with her, an invitation I’m so thankful for. Jesus is King on Harriet Tubman Street…the choir singing gave me chills, tambourines shaking, hands waving, clapping, holding hands, praying for deliverance and shouting in unison “I am covered by blood of Jesus!” When the gospel choir sang, the Spirit filled up the room so much I thought the earth was shaking. No holding back or sitting on the sidelines there. Mama Eddie and her church friends know better. I think of the one who called us into that river. I hear that saxophone playing and Evelyn’s preacher’s electrifying voice shouting “Praise Jesus!” He saw it all, yet he still went all the way to that cross for me. And continues to invite me in. When I think of him, fireworks burst in my heart and happy tears fill my eyes…because there is nothing more amazing than grace. loved this so much, katie! just precious. thank you for encouraging us to go all the way in! with Jesus -and with our little ones at the pool! Such great wisdom on all counts. LOVE it!!!!! Love you friend! i will never forget that day y’all were baptized! those are such great pictures, capturing the moments so well. my favorite is the one with y’all hugging each other. wonderful, wonderful day! and i totally agree with you about the pool 🙂 when i get in – we have much more fun… need to apply this every day! love you!! Amazing. Love it!! Praise God for His grace…it’s so sweet. Love your writing…thank you! 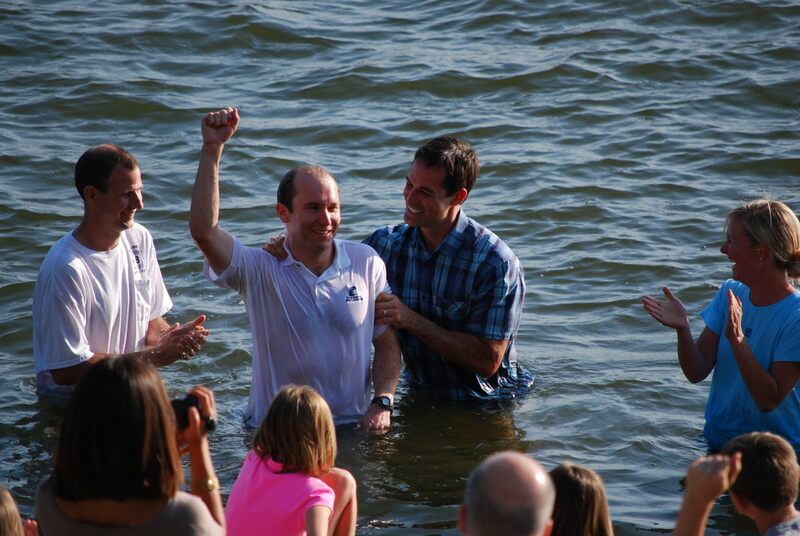 i second what Garrett said – your baptism day was amazing! love you precious friend. thanks for being such an encouragement and a truth speaker. you have a gift with words!